Thelma Lucile “Chincie” Ross was a member of the Chickasaw Nation, raised on her family’s allotted lands near present-day Tuttle, Oklahoma. “Chincie,” the name given to her by her father, is an Indian word meaning “beautiful flower.” Ross graduated from the Haskell Institute and went on to work with the Cheyenne-Arapaho tribe in Concho. She later worked at Fort Defiance Hospital in Window Rock, Arizona, with the Navajo tribe. After World War II, Ross worked as a Code Talker Administrator. 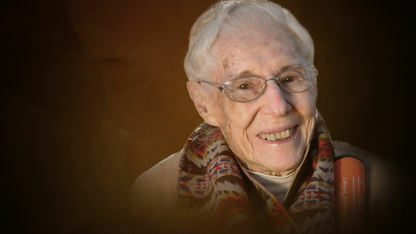 She helped process the Navajo Marine recruits who were selected to serve as Code Talkers. During WWI and WWII, it is believed by many historians, the Code Talkers were essential in securing the victory of the United States. The Navajo did not have a formal written language and were able to speak without any outsiders being able to understand their conversations. Thelma “Chincie” Ross was honored at the Tuttle High School 100th Anniversary Celebration in 2009, where she served as the parade marshal. She was proud of her Native American heritage and had dedicated much of her life to tribal involvement and furthering the progress of the Native American people. In 2015, Thelma Chincie Ross was inducted into the Chickasaw Nation Hall of Fame. Thelma passed away on May 16, 2016 at the age of 98.